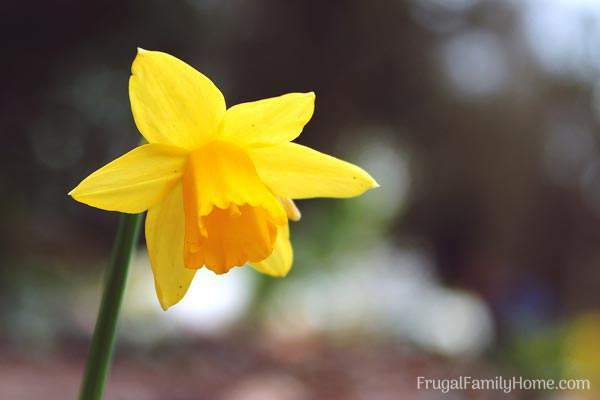 7 spring flowers that would be great to add to your own backyard garden. Plus a few berries that flower in May too. As we are coming into the month of May we usually have some really beautiful flowers in bloom. After all the saying goes April showers bring May flowers. We have certainly had our fair share of April showers this year. 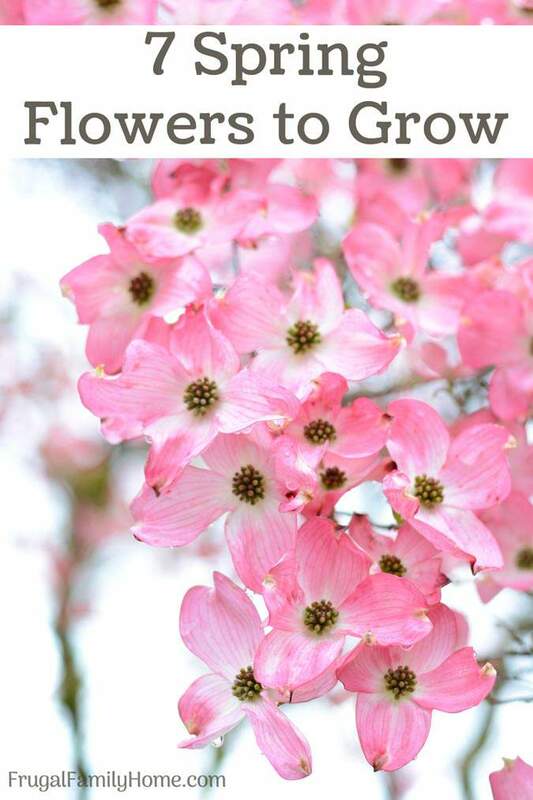 For this week’s Tuesdays in the Garden, we are all sharing about the flowers we love. 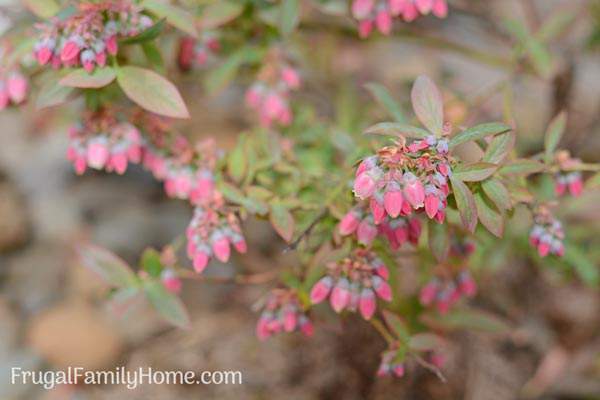 I’m sharing what’s blooming in our garden this month. 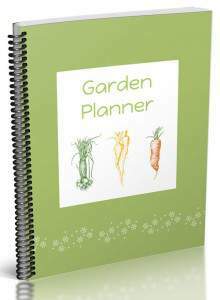 I hope it can give you a few ideas of flowers you might want to add to your own garden. All of the flowers and berries I’m sharing come back year after year. You can plant them once and keep enjoying them for years to come. The first few flowers below are ones that were in bloom last month and the rest are in bloom this month. I love how you can plant a few varieties to enjoy early spring flowers and late spring flowers too. We have a few plants that are blooming right now in our garden and we had some beautiful blooms last month too. Our daffodils were pretty short lived this year. They bloomed at the same time we had a week of heavy rain. The poor things got so heavy with rain they fell over and many of the stems bent and broke. I did bring in a few and wash the mud off of them so we could enjoy them. Our hyacinths were in bloom last month and we really enjoy them. They stand up better to the rain than the daffodils and the smell is so wonderful. The stalks that are dabbled with pink and white blooms are so pretty too. I tell myself each year I need to plant more of them but I have yet to get them planted. We have two varieties, a pink and white one and a deep pink one too. I only was able to get a photo of the pink and white ones this year, the deep pink hyacinths didn’t last long at all. Right now in our garden we have a few new flowers blooming and a few that continue to bloom from last month too. I love how the garden slowly wakes up in the spring to give us time to enjoy each new flower in bloom as its time comes. 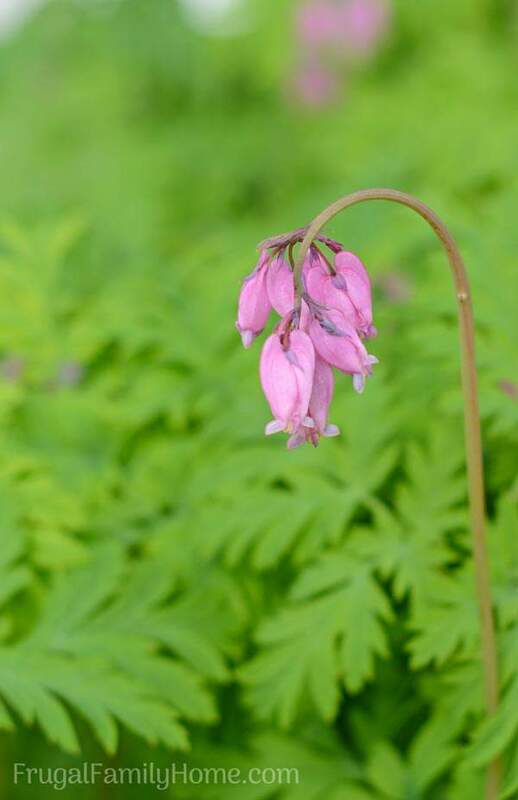 Our bleeding hearts started to emerge and bloom last month and they continue into this month too. These flowers are native to the area we live in and can really grow and spread if allowed. I love them because they are easy to grow and look so pretty. Not only are the flowers beautiful but the leaves are lacy and look so pretty. These are a great addition to a shade garden. This month is also a great month to enjoy so many flowering trees. Last month the cherry trees were in full bloom in our area. While they are pretty, I’m pretty allergic to them so I have to admire them from afar. But this month our Dogwood trees started to bloom. I thought it was going to be a while before we got to see their pretty pink and white blossoms, but they suddenly burst out in color. For the longest time, they looked as though there was no change and then seemingly overnight they were covered in flowers. We have pink dogwoods at our house and the neighbor has white. We get to enjoy both colors this way. We have a few ground covers in our yard that are in bloom right now. When we moved into our home there were a couple of ground covers already established and they have only spread since then. 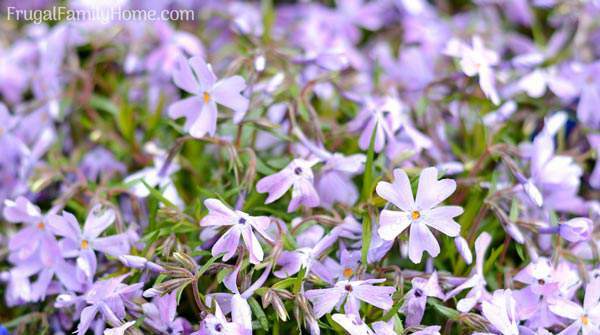 We have a nice patch of phlox near our light pole. The phlox looked like it was going to bloom for quite some time with no show of flowers and then suddenly it burst into bloom. This little plant looks like it’s a carpet of flowers right now since it’s so full of blooms. We have another ground cover that over the years has mingled nicely with our juniper bush. When in bloom the Lithodora in the color of blue really brightens up the juniper. I love how it looks like a sea of blue against the background of the juniper. Plus the Lithodora is quite popular with our hummingbirds so we see them visiting the flowers often. 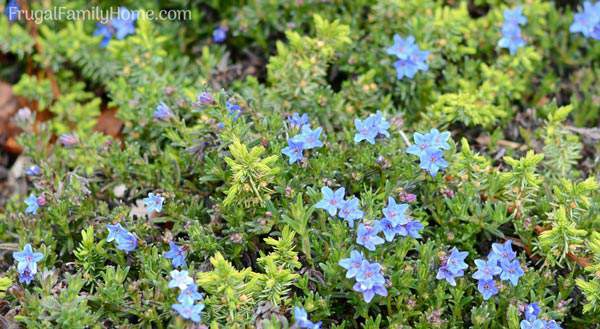 If you are looking for a spring ground cover to attract bees and hummingbirds consider adding Lithodora to your flower garden. 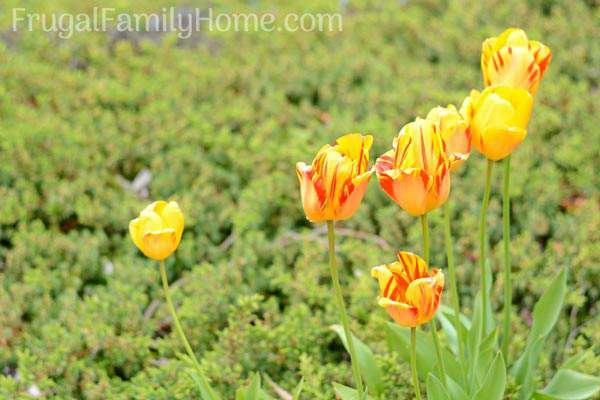 Our last flower in bloom is also a favorite of my husband’s, it’s tulips. We have a few tulips in our garden but they are pretty to look at. I wish we had more but I know with the regular rain they don’t last long in our garden. We have a pink variety and a yellow tulip with a red stripe. They are both beautiful and I only wish they lasted longer in our garden. That’s it for our flowers but we do have a few berries in bloom this month too. Our blueberries and strawberry have a few blossoms on them now. The blueberries have such a beautiful blossom on them with the dark pink and whitish tone. The flowers are as beautiful as the berries are yummy. Our strawberries are a little slow to bloom this year. They had a hard winter and I wasn’t sure how many would survive but most did. 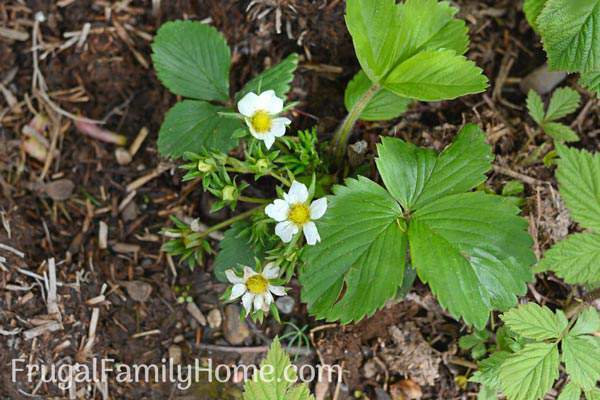 Right now the only strawberries with blossoms on them are a few I didn’t get moved out of our raspberry patch. It’s nice to see a few with blooms on them now. It gives me hope for yummy strawberries in the next few months. That’s what’s blooming in our garden this month. Below you’ll find links to the rest of the Tuesdays in the Garden bloggers and more about spring flowers in their gardens. Just click on the links or photos below to visit. 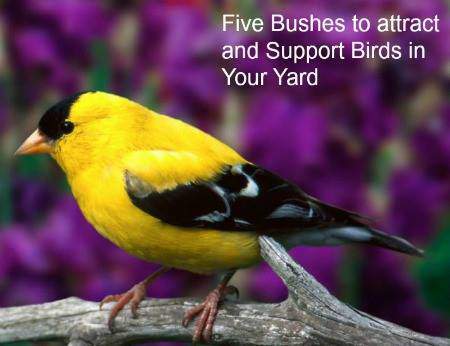 Diane has a great post on how to attract birds to your yard. Jami shared plants for the shade garden. 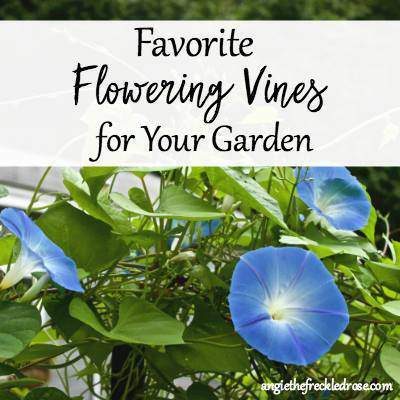 Angie has her favorite flowering vines to share. 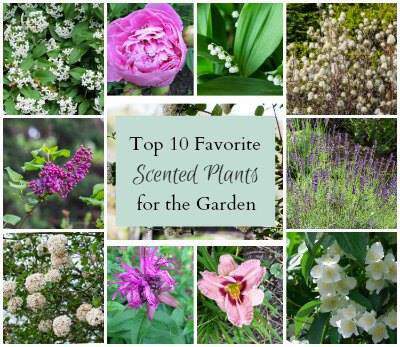 Patti shared her top 10 picks for a scented garden. 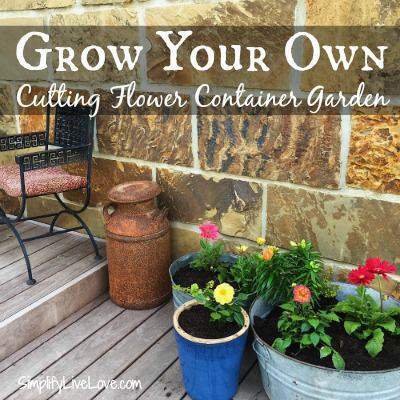 Michelle has advice for how to grow your own flower cutting garden in containers. 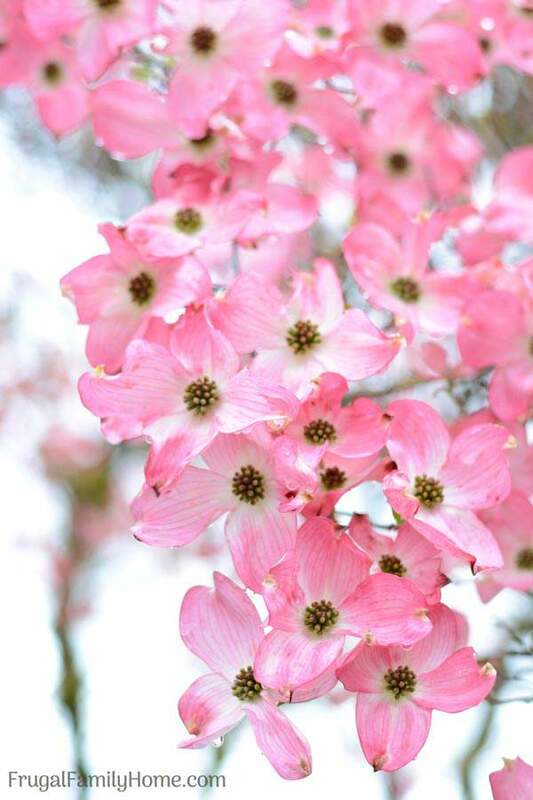 I’ve always wanted a pink dogwood and your blooms are so pretty. We have two standard white ones but the pinks ones I see around the area are stunning. I also admire your photo of blueberry blossoms. We had a couple of blueberry bushes in our old house but I don’t remember the flowers like that. 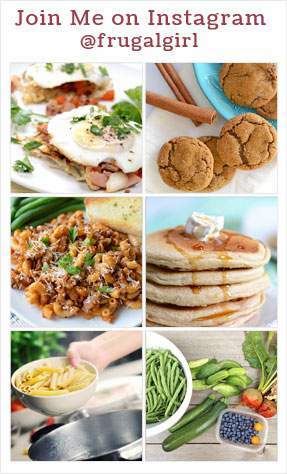 Either there is a difference in variety or I’m just remembering it wrong. (probably the later 🙂 ) Anyway, thanks for sharing that lovely. Makes me want to get out and buy one. Our blueberries are pink lemonade variety. I think their blossoms are different. Our neighbors have blueberries but their blossoms look different than ours. We have lots of dogwood trees in our neighborhood, they put them in when the neighborhood was built back in the 60’s. But only a few houses have the pink dogwoods. Our house was one of the lucky ones to get the pink ones. We have many of these and so enjoy them! Our spring too has been late, cold and wet. Everything is blooming late and looking a bit ragged. But It’s spring! There is color and life out there and blooms like the ones you are highlighting are so welcome after months of dreary grey. That Lithodora is so pretty!! New to me. I will go find a start of that. I love that bright blue flower. Thanks so much for sharing Shell. The Lithodora is really a nice bright blue in the garden. The previous owners added it to the garden when they lived here and it’s one of the plants that I adore. No kidding about the rain – I’m trying to soak up every bit of sunshine when it shows that I can. 🙂 Such great flowers – I’m glad you added the food-producing flowers, we often forget how pretty the plants are on their own! The flowers on the blueberries are so pretty. I look forward to seeing them this time of year each year. What beauty you have in your garden! We got a very late snow after a few weeks of warm weather, which started all the trees blooming and daffodils coming up. I was afraid that we wouldn’t have daffodils this year, but surprisingly, most of them did come up and we were able to enjoy them. We have had tons and tons of rain in our area too! Luckily the sun is out right now. 🙂 I love the hyacinth flowers and we have bleeding hearts blooming right now as well. It’s my first time growing them and I love them! Happy Monday, Shelly! I’m glad you are having a little sun. We love bleeding hearts too. They are so unique and pretty. I hope you have a great week!